Find My Workspace lists over 95% of the serviced offices market in Coogee. Simply click Request Quote to check pricing for one office, or Add to Basket for multiple offices. 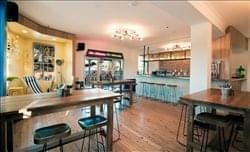 A co-working space in a brand new restaurant bar. The location that is so close to the beach that you can hear the ocean! With an amazing and funky interior and a balcony that overlooks the water, you will really find your creative juices flowing. Sample some of the excellent food and drink that is on offer to stay fuelled and hydrated for a day’s work. The centre features a variety of seating that includes; stools, couches and cushioned benches. Large windows enable plenty of natural light to reach the space and create a light and airy feel. Grab a drink after a day’s work and join one of the karaoke nights. To obtain information for your selected Coogee Serviced Offices, please tick the "Add to basket" box for each office you prefer and complete the form below. We will then send a detailed report via email.